If you love cooking you know that not all knives offer you the same precision and accuracy during prep work. 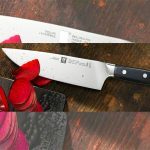 Some knives are crafted with great finesse and outstanding technology, so much so that you can tell from the mere feel, look and balance when slicing tomatoes, chopping carrots or working through a hunk of beef. A Ginsu knife set offers consumers just that precision. The Ginsu brand has been making knives for the last 90 years and became popular after an ad claiming the knives could cut through a nail, tin, a radiator hose and still slice your tomatoes paper thin. Well, that's a knife that can do a lot. But, do those Ginsu knife sets really stand up to the hype? With a Ginsu knife set you can, at the very least, expect high-quality knives within an affordable price range. Their knives hit all the metrics you should look for when buying a good kitchen knife set, too. But, knowing if they are the best set for you takes a lot more information than that. 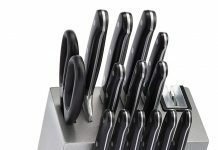 The below knife sets are affordable without compromising on the quality you receive at the end. They are derived from three Ginsu knife set lines: The Essentials, Chikara, and Koden. With this Ginsu knife set the knives don't need sharpening! Ever. They have a unique scalloped serration that does not need honing to stay sharp. The knife set comes sharp and it stays sharp throughout the knife set's entire lifetime. The set comes with a lifetime warranty which goes to show that they have faith in their product and technology. Although this knife set is serrated, it cuts with the precision of fine-edged professional cutlery. This is because the blade is constructed from quality stainless steel with a 420 series satin finish. The accurate fine cutting capability is also enhanced by a symmetric edge design on the blade. The design features expertly matched identical serrations on either side of the blade. This, combined with amazing craftsmanship, the full tang and a triple riveted handle with an ergonomic fit gives you exceptional blades to work with. These knives do not have a bolster although the clearance between the blade and the handle is adequate. What's more, this knife set is available in several colors including yellow, red and black. It also comes with an elegant wooden block that looks great on a kitchen counter. Unfortunately, it's not part of the dishwasher-safe line. 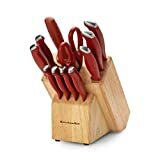 You can buy this knife set on Amazon where it has an average customer rating of 4.0 out of 5 stars. It is available on other online sites like eBay as well. Chikara knife blades are high-quality Japanese steel, which retains a razor sharp edge. It has great durability, strength and is highly resistant to rust and stain. 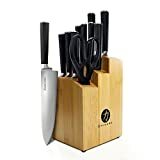 This Ginsu knife set is efficient in any kitchen, commercial or home. It is stylish without compromise on performance. Because this set doesn't have the "never needs to be sharpened" edge, periodic sharpening is recommended. The honing rod in the set comes in handy for this purpose. This set is also not dishwasher friendly although it comes with a lifetime warranty. You can buy it on Amazon where it has an average customer rating of 4.0 out of 5 stars. You can also buy it from eBay. The Ginsu Koden series has elegance written all over it. 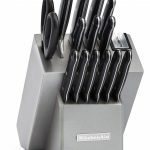 The knife set comprises of all knives that you would need for prep work on any recipe you can think of. The knives in the Koden series, just like the essential home series, do not need any sharpening at any point as they come sharp and stay sharp for their entire lifetime. A knife that does not require sharpening is very low maintenance. They also come with a lifetime warranty. The Koden series blades attend to tough cutting with absolute ease. The scalloped serrated edge is razor sharp. 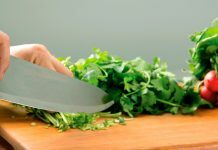 It can cut through tough foods such as meats and still maintain fine cutting precision when dealing with softer ingredients such as tomatoes, onions, and other soft vegetables. The blade is high-quality Stainless Steel that is stain and rust resistant. The knives have a satin finish for a glossy and sleek look. There is a bolster at the hilt of the blade that serves as a finger guard while infusing balance to the whole knife. The handle is hard and sturdy POM with an ergonomic design for a comfortable grip. The knives are lightweight and easy to use for an extended period when you have a lot of ingredients to prep. The storage block saves space on your counter as it can comfortably accommodate all blades in this set, shears and sharpening rod for a neat and organized counter. You can buy this product on Amazon where it has an average customer rating of 4.5 out of 5 stars. It is also available on eBay. How Do the Ginsu Knife Sets Meet Our Standards? All the above Ginsu knife sets are aesthetically pleasing and will look great on any kitchen countertop, with color variations to work with you can choose colors that suit your decor. Their construction is solid as the handles come with rivets to hold them in place. The blades are well balanced because of bolsters and they are durable as well. They have excellent design concepts like the scalloped edges and the no need to sharpen technology. Overall, these Ginsu knife sets are excellent additions to the kitchen arsenal. Ginsu has a lot of competitors. Here are a few. These knives have high carbon stainless steel blades. As such, they are able to hold their edge for long when in constant use. Their contoured handles offer an excellent, natural grip regardless of the size of the hand. This KitchenAid set is commendable for the balance of the knives. They are not full tang but they handle well giving you precision when cutting. 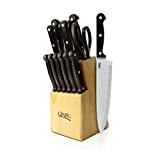 With an average customer rating of 3.6 out of 5 stars on Amazon, this knife set performs better than expected considering the handles are plastic. They polish very well and the steak knives have a straight edge excellent for cutting through steak like butter. Compared to any of our Ginsu knife set the Santoku knife and serrated knife in this KitchenAid set are smaller at only 5 inches and 5.5 inches respectively. The blade on this beat the Ginsu knife set because they use high carbon steel on the blades while the two Ginsu sets use Stainless Steel. Wusthof knife sets are high-end products but does that make them better than a Ginsu knife set? 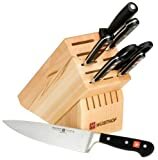 This Wusthof knife set offers you the four most basic kitchen knives: Chef’s knife, paring, serrated, and utility. The knives have the right weight to facilitate cutting but are not heavy. Their handles are long-lasting synthetic, and they stay in place because of the rivets holding them on. The block comes with additional free slots, which you can use to store your older knives. Compared to a Ginsu knife set this set has a higher price point. However, Ginsu knives have the option of not needing sharpening ever but still remain sharp while the Wusthof knives need consistent sharpening to remain so with time. Their blades are high carbon stainless steel against the Ginsu Chikara series’s Japanese steel and the Essential and Koden series's Stainless Steel. Both sets work exceptionally but the Ginsu set offers more options, with equally high-quality at a lower price point. This set includes every knife you need: chef’s, serrated, carving, utility, paring, and steak knives. The full tang blade is from high carbon 420-grade stainless steel. They are sharp from the package and perform excellently in cutting with precision. The steak knives are serrated and hold up well just as well as straight blade steak knives. The honer keeps the edges in excellent shape and the handles are stable because of the riveting holding them in place. Compared to our Ginsu knife sets the constant need for sharpening and honing becomes a distinct disadvantage. The set performs just as well as our Ginsu sets in terms of cutting and precision. It has an average customer rating of 4.0 out of 5 stars on Amazon where you can buy it. It is also available on eBay. A good knife fits your hand comfortably regardless of the size of your hands. It's also easy to wield during the prep process. In addition, good kitchen knives should have the following basic qualities. A good handle remains firmly in your grip even when wet and has a good length. It's also comfortable, especially when using it for heavier tasks like hacking through bone. Some handles are textured or have indentations where your fingers grip it. Just make sure you choose one that is comfortable for you according to your natural grip. It is always best to hold the knife in your hand before buying. A good handle also has enough clearance between the handle and the blade so your knuckles don’t get in the way during use. Don't equate weight with quality. A knife with a thick blade is often tricky to use, unlike a knife with a thinner blade. The weight usually comes from the quality of materials. High carbon blades tend to be heftier than their stainless steel and ceramic counterparts. The handle also adds to the overall weight of the knife. Keep away from very heavy materials on the handle because they interfere with the balance of the knife. A bolster is at the junction between the blade and the handle. It gives the knife the required balance on the blade, and the handle and makes the knife more durable. Knives with a bolster provide better control. The bolster also protects the fingers during use. Bolsters are mostly found on forged knives and give an idea of the thickness of the steel used on the blade. Some stamped knives and laser cut knives also feature a bolster. It's no good to buy a knife that you can't easily maintain and care for at home. High carbon and stainless steel knives only require a good hand wash and thorough drying to prevent corrosion and keep them in optimum condition for longer. You can sharpen them using a knife sharpener and hone them using the steel honing tool. Ceramic knives, on the other hand, cannot be sharpened at home using a regular knife sharpener. You must send them to a knife specialist or back to the manufacturer for sharpening. They're also prone to chipping and can altogether shatter if dropped. Despite this, they hold the edge better and longer so sharpening is not regularly required. 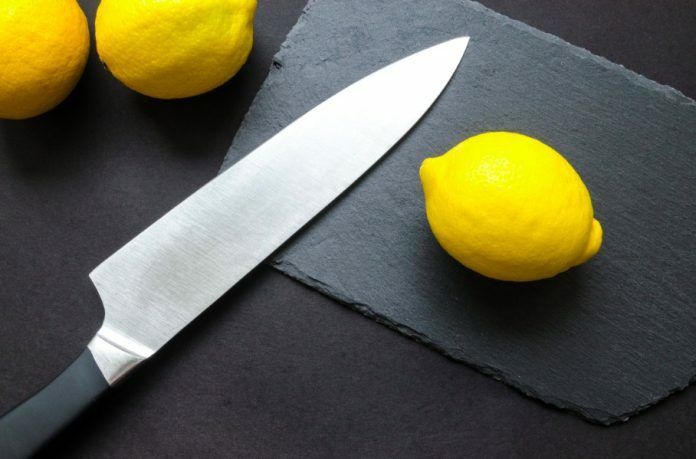 There is really no best tang for a good kitchen knife, though many may object to us saying so. The best tang is one that works for your needs and assures a well-balanced knife. Japanese knives have been known to be half tang but are no less robust and are lighter than their western full tang counterparts. It is all dependent on how the knife works and how it feels for you. First, Ginsu offers a line of knives that are not only stylish but hardy, effective and durable. 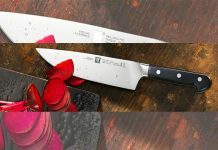 This brand has a "no need sharpening" knife series, excellent for people who love to cook, and for professionals. These knives never need sharpening for the duration of their life. They stay sharp even after you stop using them. Second, Ginsu has a dedicated line of dishwasher-safe knives that have been engineered to withstand the harsh abrasive detergents and aggressive technology used in today's high-efficiency dishwashers. Most knives brands recommend hand washing as opposed to throwing your knives in the dishwasher. The reason is pretty simple: modern washing machines cause knives to rust, warp or lose their edge quicker. But not the dishwasher-safe knives from Ginsu. These knives will not warp, rust or dull even after a cycle in the dishwasher. How Much Will You Pay for a Ginsu Knife Set? A Ginsu knife set can have a variety of different sizes and intended uses. There are smaller series for home cooks, as well as mid-range series, and even a gourmet series, all at pocket-friendly prices. A Ginsu knife set can run you between $25 and $290. Prices are dependent on the number of knives in the set, series and, of course, the vendor you purchase from. When reviewing these sets of knives, we looked at the aesthetics of the set to see how it would look on the counter. We also paid close attention to the construction of the knife and whether it has any safety features, interesting technology, and how components like the blade and handle come together. Finally, we looked at the weight and general balance of the knife during use. Should You Buy a Ginsu Knife Set? The three Ginsu knife sets are exceptional in their performance. However, despite the Essential series's color variation and the Koden series's sleek polished finish, the Chikara emerges as our favorite. The combination of excellent forged construction, highly durable Japanese steel and a beautiful bamboo holder culminate in a great product. It is, without a doubt, the Ginsu knife set to have. As for the competition, there are obviously some worthy knife sets out there. But the no-sharpen Ginsu technology makes a Ginsu knife set hard to beat. Next articleVictorinox Knife Set: A Cut Above The Competition?